Listen in. 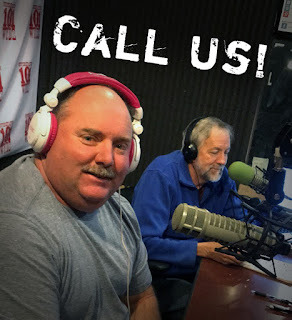 Give us a call (205-941-1011) on the 101.1 Drag Race Central radio show on 101.1 FM WYDE in Birmingham, Alabama this Saturday, Dec. 29 from 6-8 AM (Central Time). Listen in as Junkyard Life's Keith Lively joins Drag Race Central's host Randall Shew to give an update on the VW Mega Bus Build. 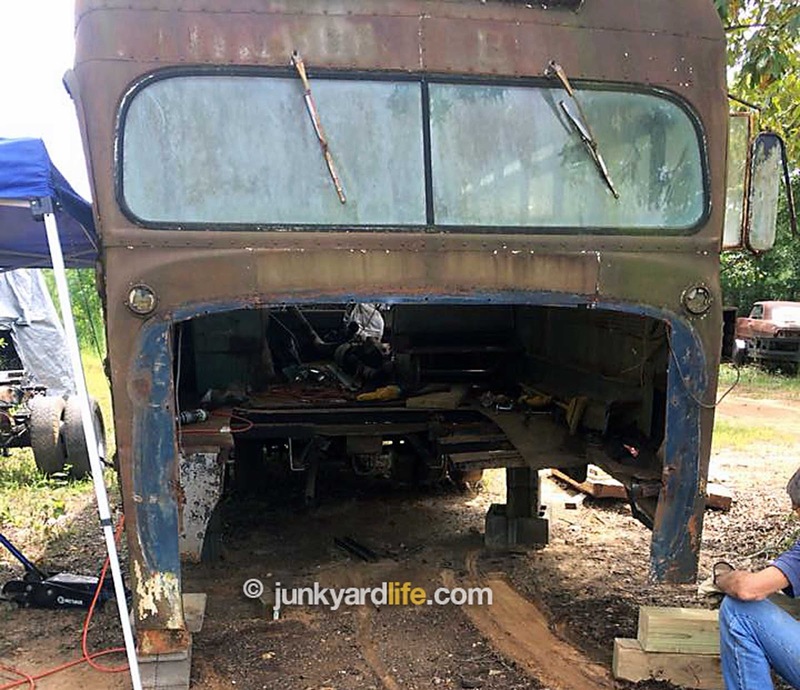 For those wondering, that's a 1961 Ford B600 bus sitting on the front half of a 2005 Ford F350 chassis with a 1997 Cummins diesel out of a Dodge truck. 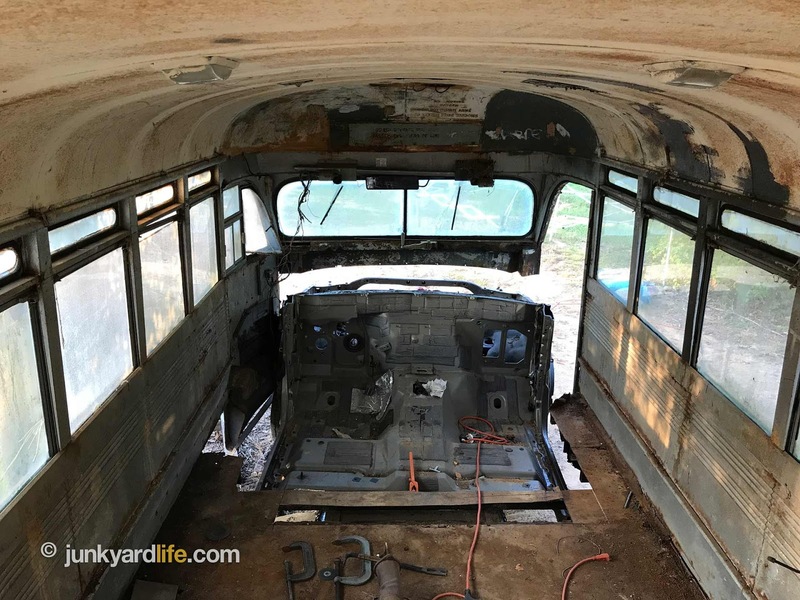 Junkyard Life is working feverishly to complete this one-of-a-kind super-size custom VW bus for the Hot Rod Power Tour. 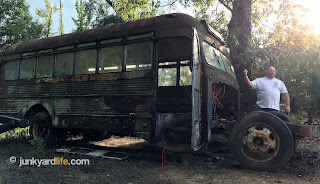 We're going on the Hot Rod Power Tour in 2019 in this bus! Fire your impossible questions at Keith. He has seat time behind the microphone and a mouth that moves at 100 mph. 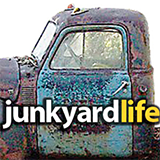 Junkyard Life is alive and well! Call us Saturday, Dec. 29 from 6-8 AM (Central Time) with questions about the build or other story updates: 205-941-1011. 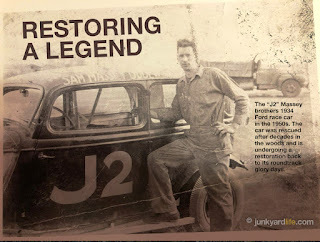 Want to talk about old race cars? Call us. We’ve done stories on those as well. 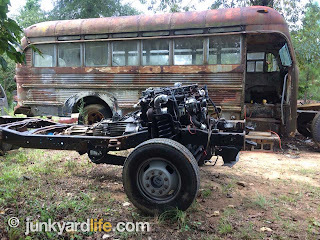 Read about the 1934 Ford we pulled out of the woods here. The 1934 Ford race car rebuild story here. 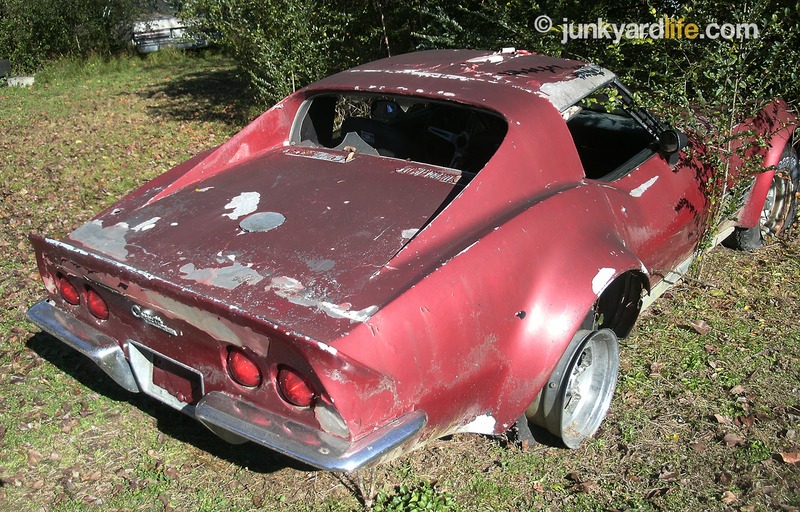 Call it a Corvette winter for Junkyard Life. 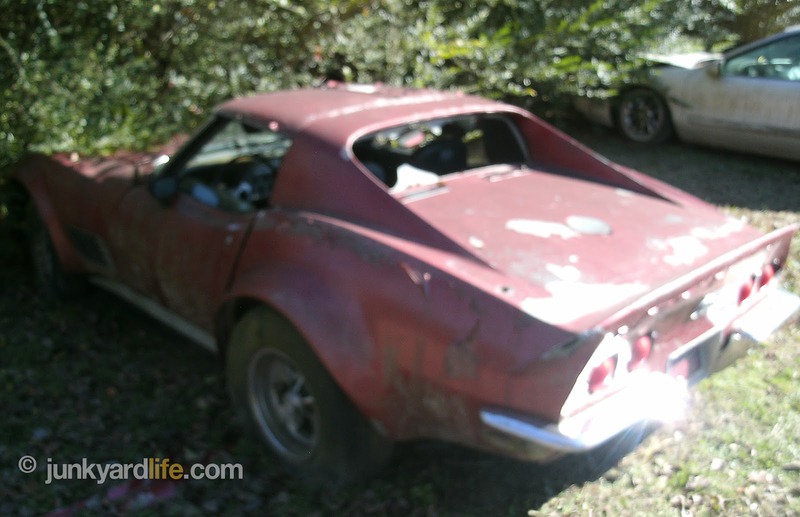 We have uncovered yet another mystery Vette! One might say it is even a season of Corvettes. So many twist and turns, add a little arbitrary fate that never fails to lead us to another abandoned Chevy. Breaking almost all of our journalistic integrity, we write the story, but we really can only speculate. 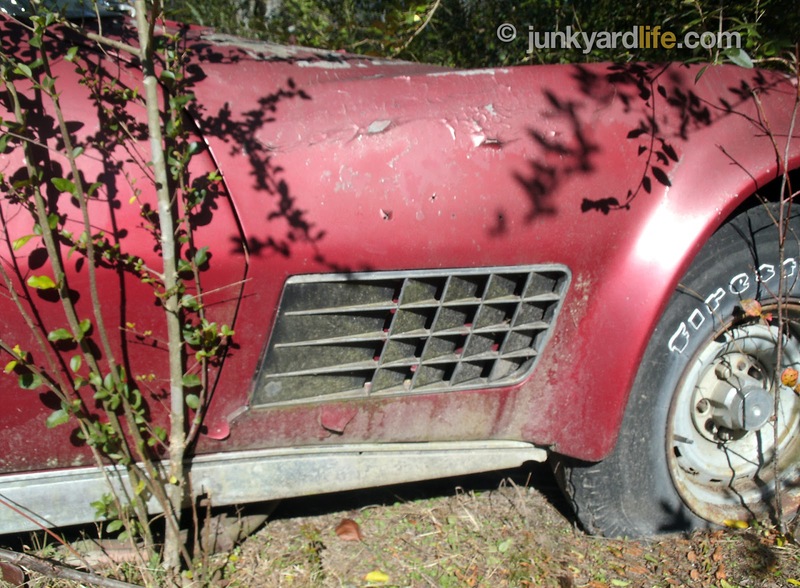 Not that I (Ron) am ever truly prepared to put automotive archeology on paper, but with this Corvette… I am as lost as anyone. Maybe ahead of other Corvette followers, only because I found a paint code. That just about ends my knowledge of America’s once world-class entry into the supercar world. Guilty, your honor. This is all purely conjecture at this point. I think it is a 1969 model. I think it was a small-block car because of the flat style hood. It was for sure a t-top model. 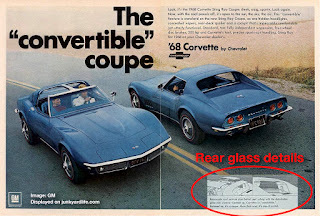 I am not sure that the rear window of this Corvette “popped” out like the advertisements for the 1968 proudly proclaimed. 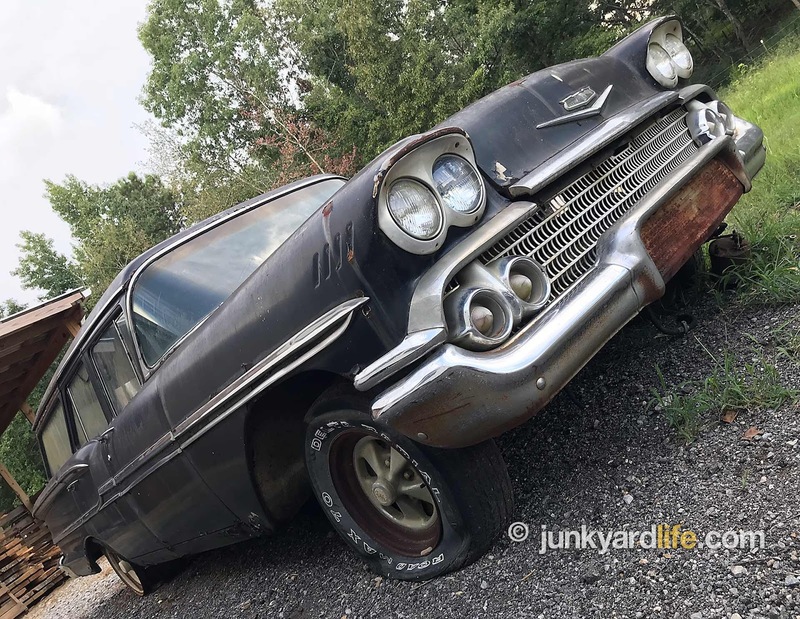 The console tag that usually provides RPO codes, the horsepower, the torque, cubic inches and compression was long gone. 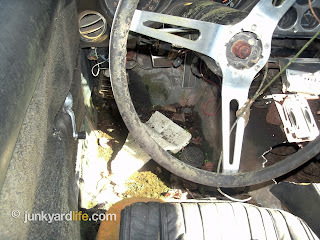 As were the engine and transmission, which by the way was a four-speed. One of the few things I am sure of. One and four things, if you will. We don't find many chrome-bumpered Corvettes in the weeds anymore. 1968-code 983 would be British Green - the most popular color for Corvette buyers in ’68. 1970, 1972 & 1973 code 983 would be very rare, because there were none. This Vette was originally green but was repainted in a shade of red similar to Marlboro Maroon. Check out the custom bodywork. 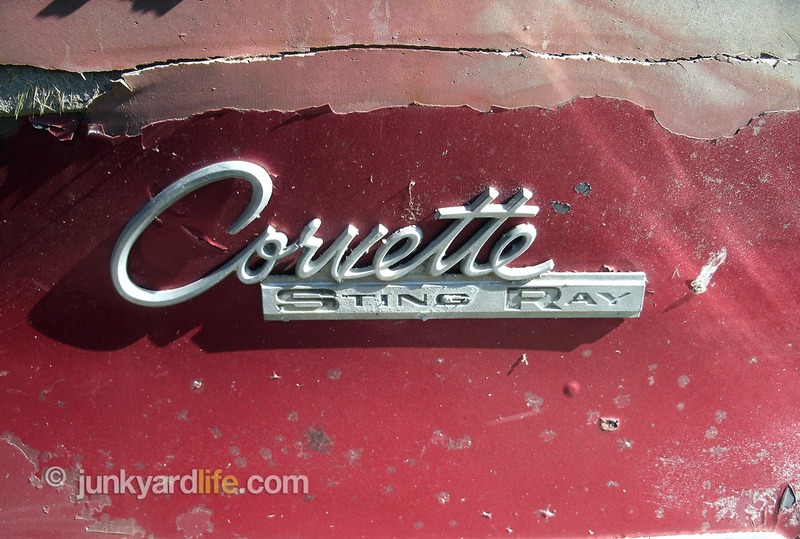 Originally a 4-speed Corvette but the drivetrain is nowhere to be found. muscle man kind of machine. Corvette was the performance gauge to which others tried to beat or at least match. Still, there was no shame in losing to one. But we usually assume the donor Corvette was wrecked. Then the good stuff saved and transferred to another car for bench racing bragging rights. This car was not wrecked. 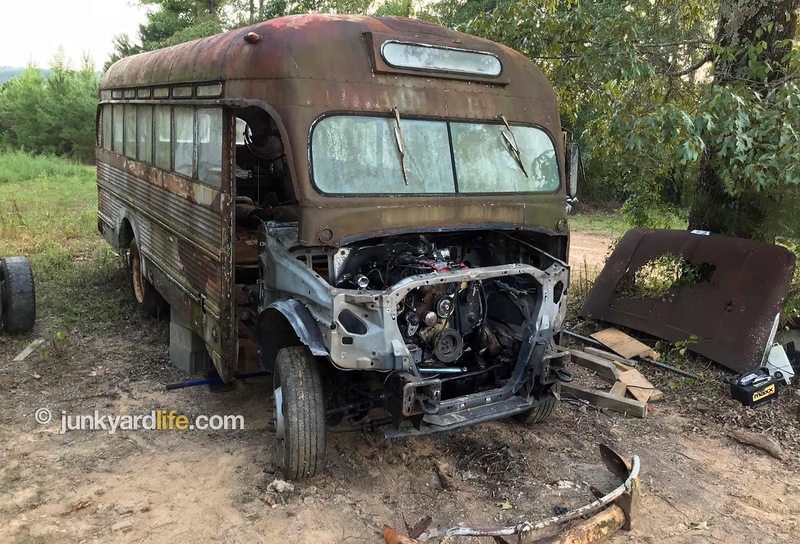 Granted, it was not in good shape. The idea I got from my interview was that over the years, the car faced a series of unfortunate events that lost or destroyed the places it was stored. Eventually, the car arrived here simply for that reason. Life and other obligations relegated the Vette to this spot. It will be stored properly again soon. Sting Ray emblem is from a 1964-65 model Corvette. 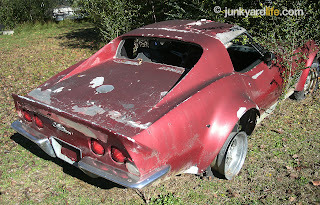 So, Sherlock Car Guys, Vette enthusiast and fellow Junkyard Life readers. Help us out! We know it is a 1968-1973 — we know that. 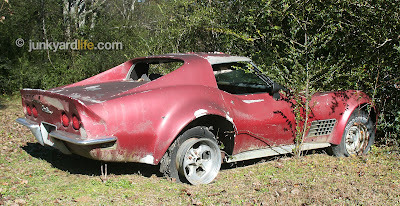 Help us solve what this Corvette really is. What model year is this? Is this a “World of Wheels” circa 1975 custom job? Do the taillights really tell us something by not telling us anything at all? Why can we not have caffeine in our Strawberry Fanta? (Editor’s Note: JYL staffer Keith owes me $5. I told him that Ron could not make it through this story without asking/using a statement never before referenced in a JYL article.) 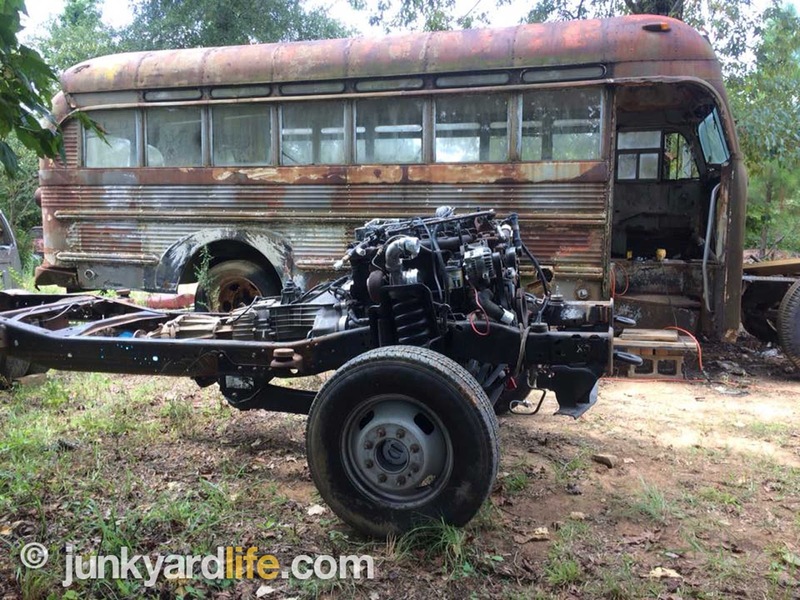 Armed with the right information, maybe we can inspire the owner to start turning wrenches on this fun-mobile. Yes! — Help us help him. 1968? 1969? 1971? How close are we? What do you think? Comment below. Clues! 3 skinny pedals in the floor for the manual shift Vette. Egg crate side gills lead us to believe this is a 1970, 1971 or 1972 model Corvette. But who knows with all the custom additions. Custom headlights replace the pop-up versions. Just to confirm, nothing to see under the hood. It's a V-0 engine. 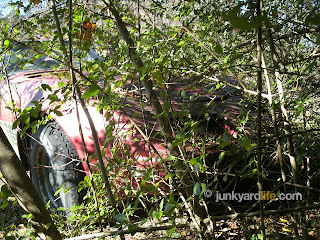 Look close you may find a Corvette in the thicket. Corvette introduced the "pop-out" rear window to give the car a convertible feel when the roof panels were removed. 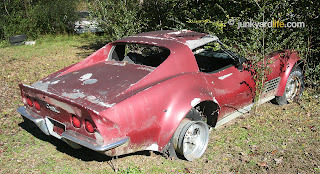 Our mystery Vette was missing the rear glass. Maybe it "popped out?" Sorry blurry pic, but it's the only one of the driver's side on the mystery Vette. 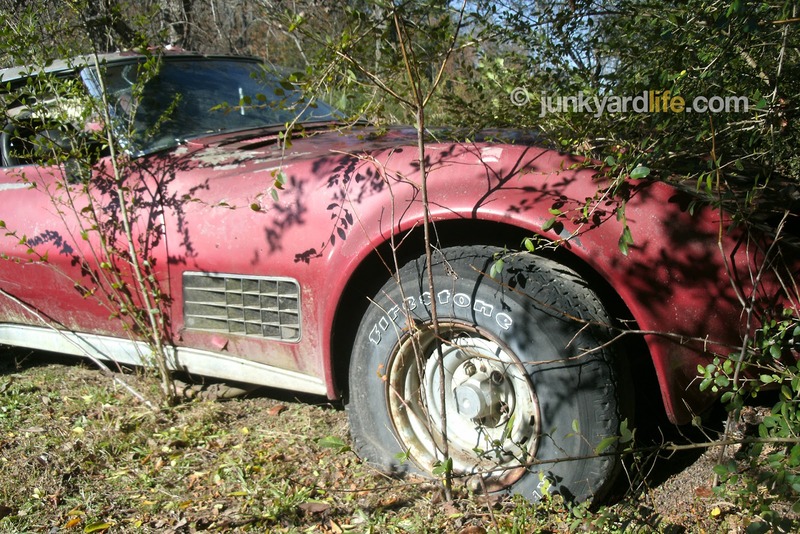 The custom work on the Corvette may have been just enough to devalue it to yard art status after the drivetrain disappeared. 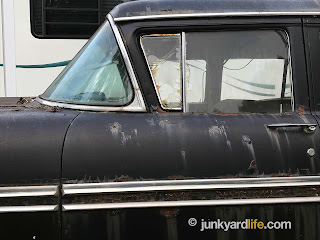 We see potential and memories of hot rod days gone by. 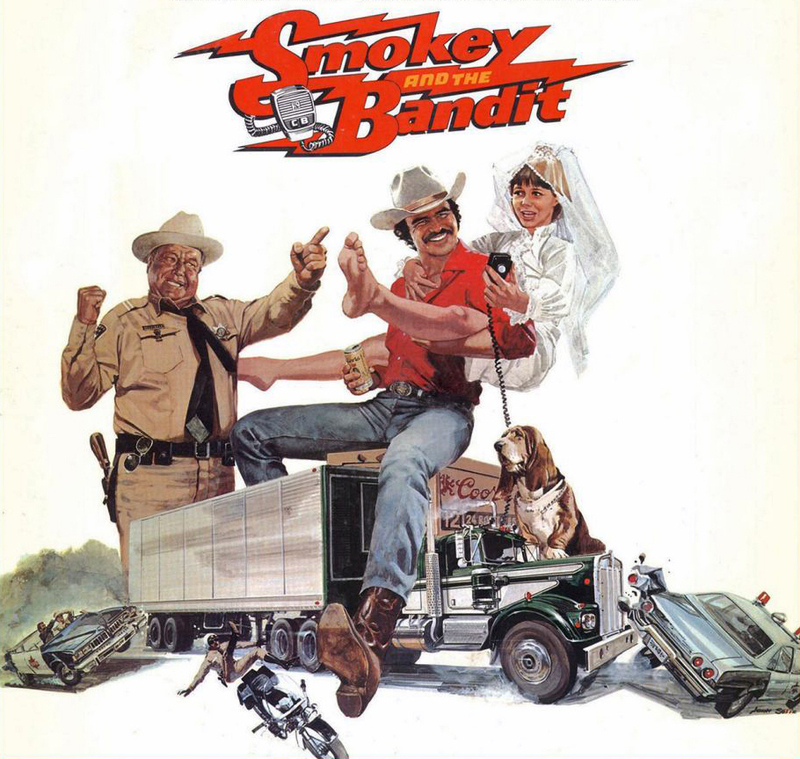 Ride on, Mr. Bandit. September 6, 2018 was a sad day for many people. 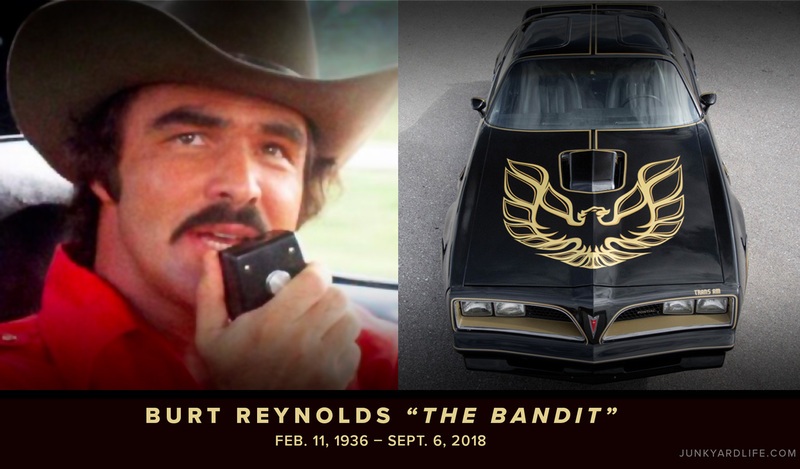 With the passing of Burt Reynolds, we all lost a little of The Bandit that lives within us. Especially the Pontiac crowd. We all credit Reynolds and Hal Needham for the massive popularity of one of our favorite cars of all time — the Pontiac Firebird Trans Am. Adorned in black with miles of gold pin stripes. Pontiac may have built the car, but Burt made it. I was but 7 years old when I fell in love. As did the world when the Bandit, Bo Darville, pulled that 1977 Trans Am S.E. out of the back of Snowman’s rig. A collective gasp rang out across the theater as well as the nation in that moment. The world got its first look at the 1977 Trans Am Special Edition that day. The visual impact, the sound and the power hypnotized us for the rest of the movie. Skip the popcorn. The car didn’t just have a hold of us during the movie. I mean it gripped us for the rest of our lives. That's what Hal Needham, creator, producer and director of Smokey and the Bandit, told a skeptical Pontiac marketing representative. True to his word, the sales began. How could anyone with a heartbeat see this car and not want it? It should be noted that few people were in the market to buy a car that year. Only now they had to. There was no getting out or around it. His prophetic prediction proved to be very true. People were having their new Trans Ams painted black if a black one could not be located. The movie strengthened America’s obsession with t-tops. They were a “must-have” item. 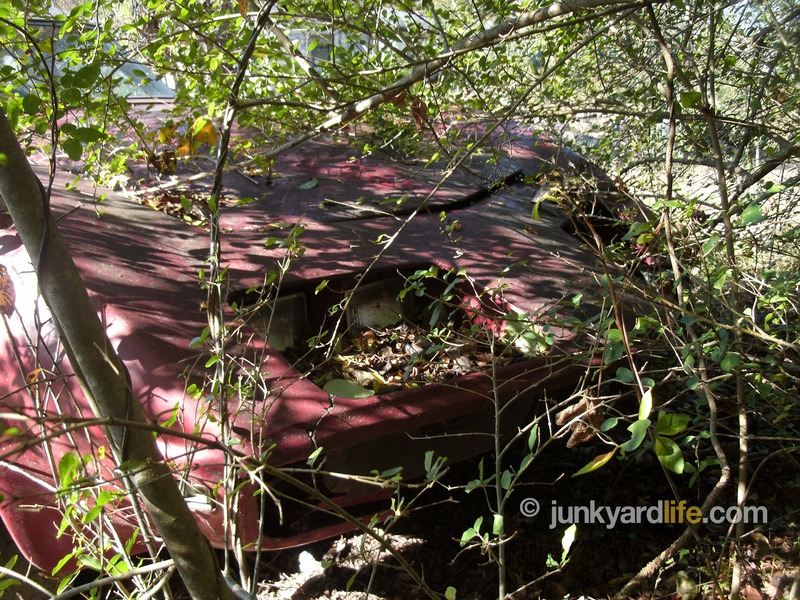 Pontiac called them “Hatch Roofs.” They hatched something alright. Millions of brand new car enthusiast. Oh yeah? It could buy far more than that for several demographics. It bought you a bit of rebellious expression. It bought you a fun way to do otherwise mundane things such as go to work, school or even the grocery store. It bought you a personal dose of rock and roll and infused it into your life. It bought confidence. It bought you cool. It was Trans Am School and our teacher, Burt, showed us the way. Errands became fun and exciting if your inner Bandit made an appearance. 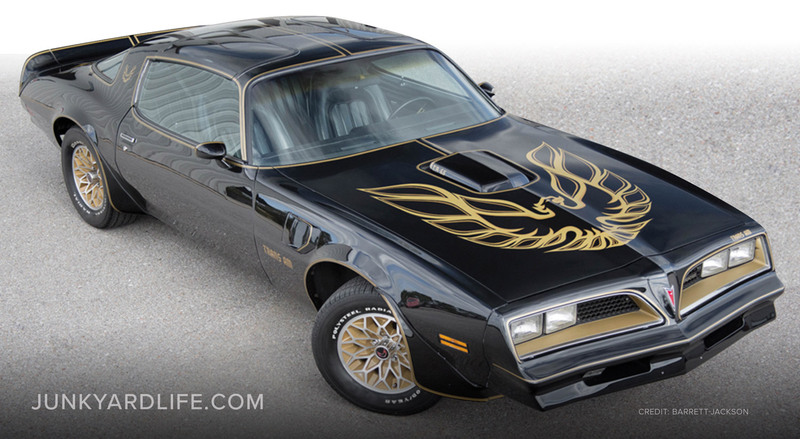 This 1977 Pontiac Trans Am, used as promotional car for “Smokey and the Bandit,” sold for $550,000 in 2016. Thank you Burt. Those of us too young to buy a Trans Am begged our parents to let us pretend, somewhat, with phoenix-adorned jackets and hats. We bought Hot Wheels and even bicycles striped like something Mr. Bandit would ride. We didn’t know what product placement even was, but even if someone told us, it was too late. We were bitten by the Firebird disease and would be affected for life. My parents watched something on Saturday afternoons that was sponsored by Pontiac. My seven-year-old ears could pick up the sounds of the ’77 and ’78 Trans Am commercials even from another room. “Don’t sit too close to the TV!,” my Mom would yell. If I were any closer, I would have been inside the TV. My blue jeans would be scuffed up from my homerun-like slides toward the TV from a running start whenever I heard the sounds. 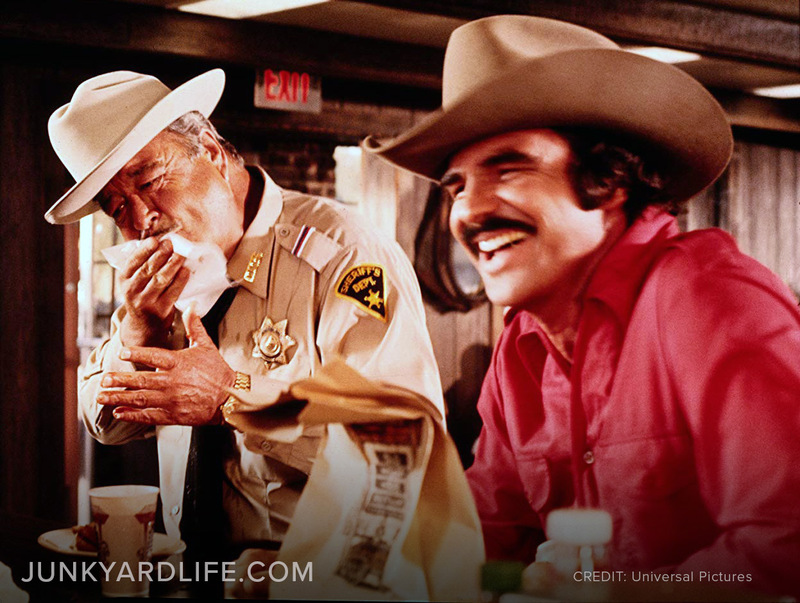 Jackie Gleason and Reynolds ad-libbed most of the diner scene in "Smokey and the Bandit" – few scenes featured the two stars face to face. What a blessing it has been though. Through this Pontiac Firebird community we’ve met a lot of great people. 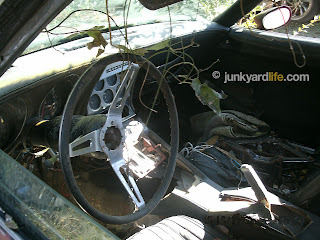 Junkyard Life enjoys finding and writing about these special cars. I (Ron) just drove my 1979 WS6 to Ohio for the Trans Am Nationals where the Birds are celebrated to grand extent. Our friend, Greg, hosts a Firebird Bar-B-Q that rivals the Tipp City, Ohio (America’s largest Bird only cruise in). We have completed several Bandit Runs, a Smokey and the Bandit-inspired scenic road trip hosted by Dave Hall’s Restore A Muscle Car. All these enthusiast do a great job of organizing these things so we can enjoy making new friends and spending time with our old one. I bought my daughter so many Hot Wheels Hot Birds that she asked me to stop (or buy her something else occasionally). Jody too, has a Firebird-loving daughter who has her own 1978 Formula. It is kind of funny how he seems to still think that his beautiful black and gold 4-speed T/A is safe around her. How many times do you remember being at a teenage cruise spot and someone pulls up in a hot car you have never seen? “It belongs to my dad. He doesn’t know I have it out.” Only a million times. Sorry, Jody. So, thank you Burt Reynolds for giving us a persona and an alternate identity we could morph into and all feel better about ourselves. Our inner Bandit will shift just a little harder and push a little further to the red line. You had a long way to go and a short time to get there. You showed us how to do it the fun way! I can imagine Juniper Florida on that historic, somber day. I foresee Highway 1 lined with fans, friends and Firebirds as the funeral procession rolls through. We will miss you, Burt. One iconic man that will not be forgotten as time rolls on. Forever a legend. They call him The Bandit. We’ll fix your little black wagon! 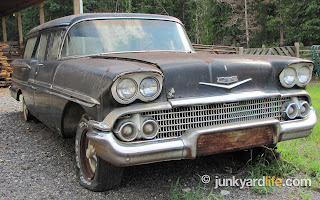 At Junkyard Life all wagons have a history that invites and entices us. Their stories, often similar in content become all their own once the memories start flooding back. The Hurst family, of Fultondale, Alabama, have seemingly always been involved with cars. 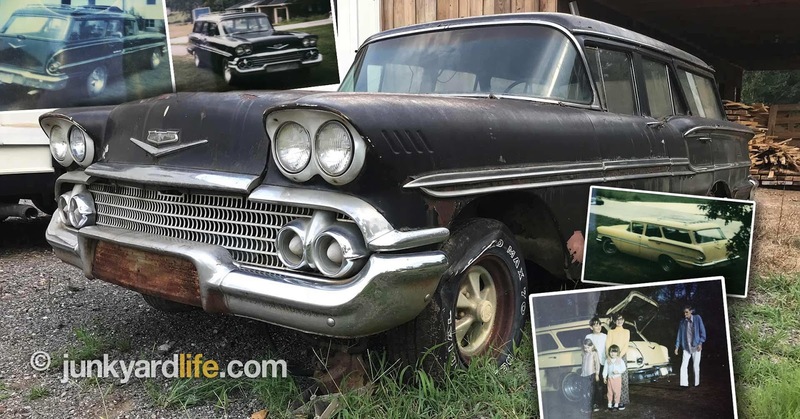 And they own a station wagon full of family history — their freshly-rescued 1958 Chevrolet Brookwood Wagon. The Hurst family did not buy this car new, although they didn’t miss by much. Gilbert Hurst knew a thing or two about cars. 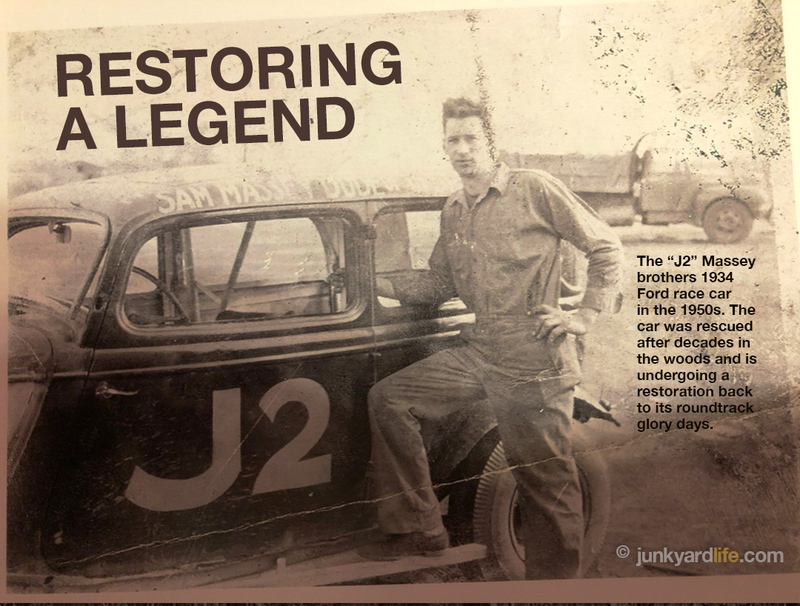 He owned and operated his own auto repair business during the 1960s. A dependable family car was a top priority for this family-minded mechanic. Also, Gilbert may have known a good deal when he saw it. Enter into the Hurst family a Sierra Gold Brookwood Wagon. This moderately optioned wagon had the very important third seat option. With a growing family, Gilbert and his wife Sylvia needed the room. Their daughter Kathy was soon granted a little brother, Lynn, in 1962. 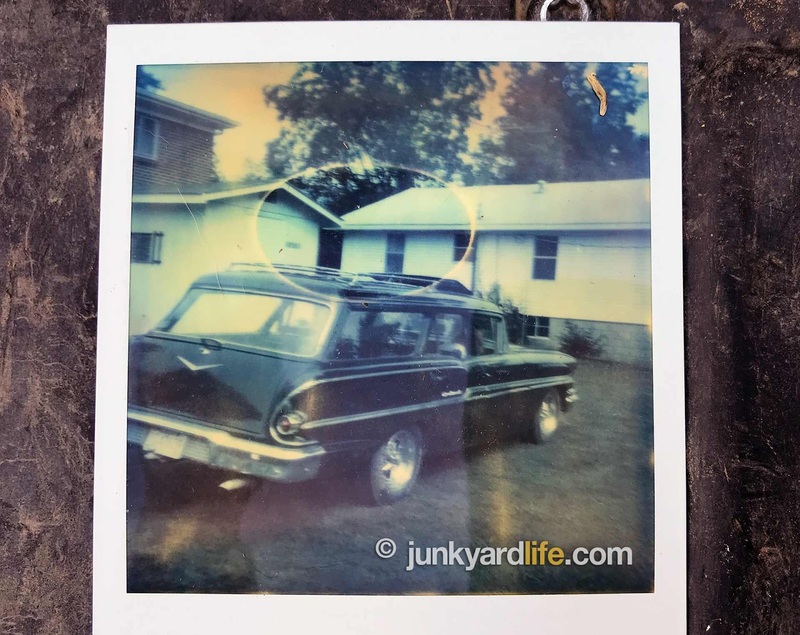 Lynn Hurst arrived and this station wagon would prove to be a very valuable part of his history and definitely made him a car guy for life. Despite the almost new wagon being born Sierra Gold, it did not stay that way. Gilbert Hurst was a huge Nascar fan in the 1960s and decided the wagon would better represent his racing passion in Daytona Yellow. Gilbert Hurst painted the 1958 Chevy Brookwood wagon Daytona Yellow in the late 1960s. Throughout the remainder of the 1960’s this now yellow Brookwood wagon was put through the torture of being a family utility vehicle. It is a good thing the station wagon they picked had a third row seat because Gilbert and Sylvia had a few more blessings coming their way. Pennie Hurst arrived and gave Kathy a little sister. Traveling with a family of five is no easy task. Make that a family of six when Laura made her debut only to give up the role as the family baby to the youngest Hurst addition, Melinda. Now we have a family of seven to carry around. Is there a better vehicle than a wagon? 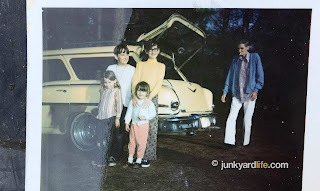 A few of the Hurst children ready for a trip in the ’58 Chevy Brookwood wagon (early 1970s?). So, what was the weapon of choice nestled between the fenders of the old faithful family truckster? Surprise! It was not we thought. We guessed a 283-V8 engine. Introduced in 1957, the 283-V8 made an impact on buyers. But, new for the 1958 line, there was a new power plant on the menu... a 348 c.i.d. V8, which made more horsepower (250). Bigger is better, right? Gilbert Hurst took a chance on this strange power plant. What is this new “W” engine? This weird shaped engine had to prove itself in the long run. For many years and family trips Gilbert Hurst tested the limits of the 348, using it to pull boats, campers and other trailers. Years and many miles later the 348 gave up. Gilbert Hurst, being the car guy he was, did not intend to let the family’s best friend sit idle long. 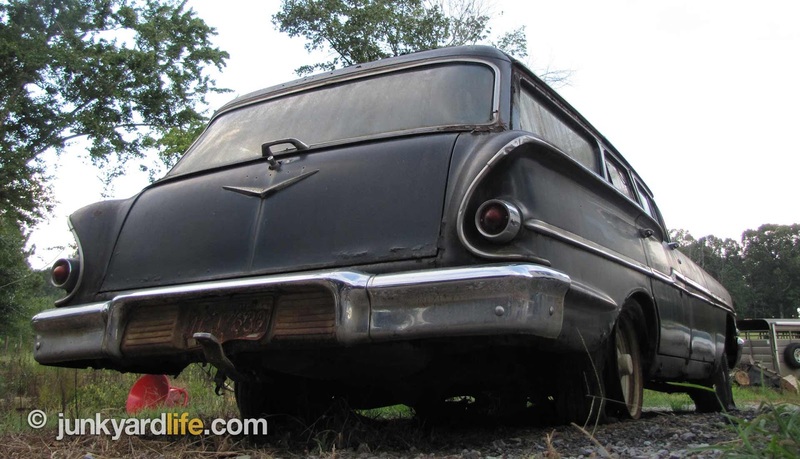 He yanked the original 348 motor in favor of a 350 from the classy Buick division of GM. To be fair, the 348 did last over ten years and had a lot asked of it. How long could you carry seven people and pull a boat? So, now we have a Buick powered Chevrolet wagon in a color you can’t miss! In the early 1970’s Sylvia Hurst got a job as a mail carrier (see fun facts) and the Brookwood wagon made for a perfect delivery vehicle. Then, in 1974, it earned semi-retired status in favor of a new family car. What could take the place of this family friend? A really huge, and new, 1974 Ford Country Squire wagon. Was that the end of the line for this interesting and frugal mode of transportation? Not by any means, wagon fans. Fear not! Two years after the arrival of the new Country Squire wagon, the Hursts car crazy son, Lynn, turned sixteen and must have the keys to something. 1958 Chevy Brookwood wagon was painted black when teenage son, Lynn Hurst, got the keys to the family car. A new color? That is a big ten-four! The Daytona Yellow was cool, but that was dad’s color. Now we have other plans. Seeing this as an opportunity to make a cool car even cooler (hotter?) the color must change. 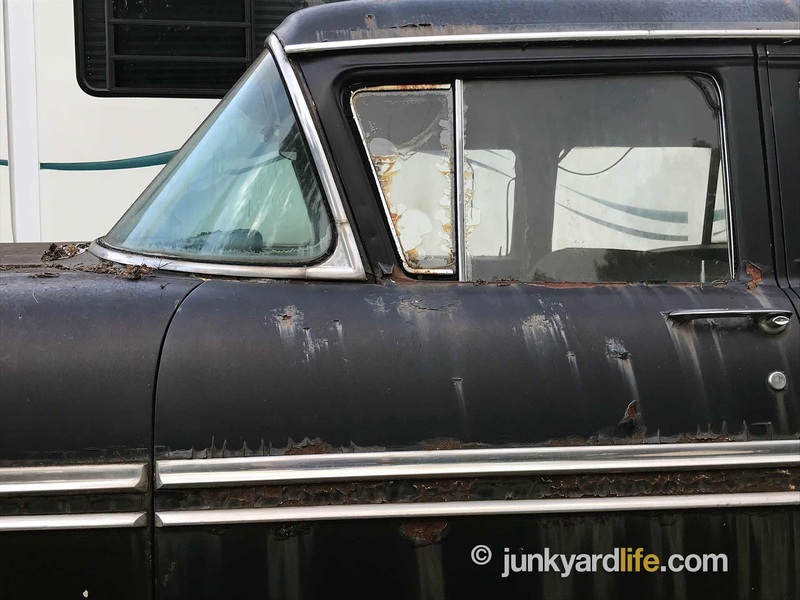 Lynn Hurst declared jet black was to be the third color fate of this Buick-powered wagon. Rolling with the times, this also called for an AM/FM/8-track and better speakers. Hear ye indeed, Lynn. Anybody who was cool and wanted to avoid “smokeys” had to have a C.B. radio too. It was a 1970’s rule. The interior was elaborately redesigned in matching black rolled vinyl. 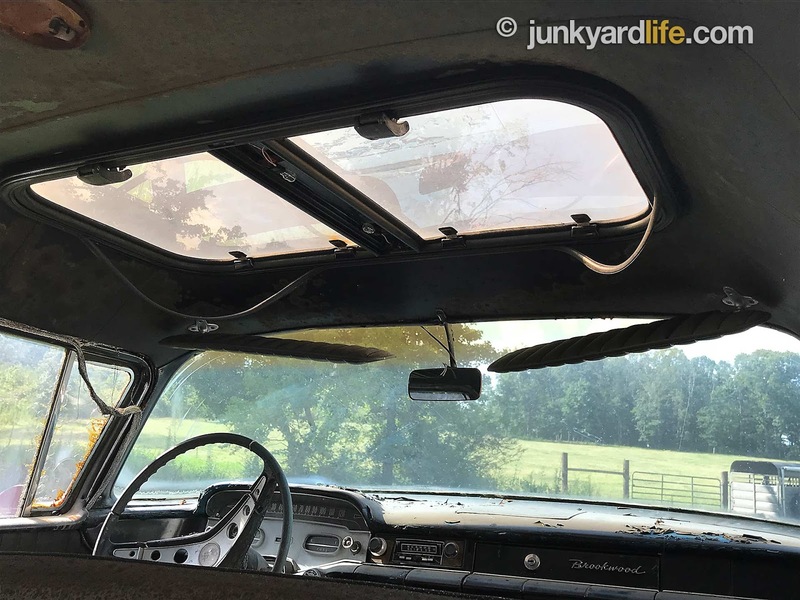 Dual pop-up sunroofs were also installed. 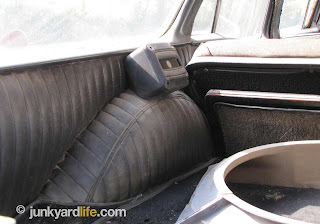 CB radio still resides inside the custom interior of the ’58 Chevy wagon. The paint was literally still wet when dad, Gilbert, drove the wagon to the Daytona 500 in 1970! They just pulled the tape off and packed the car! The entire family also went on a trip to Daytona around 1973. During little league baseball season the wagon was loaded full of baseball players going to games around the county. As many as ten people piled into the wagon! A prankster teenager that he was, Lynn had a switch that turned off the tail lights in the wagon. A friend was “chasing” him in a Ford Pinto and turned off the Pinto’s headlights on a dark road. Lynn switched off the wagon’s tail lights and made a sharp turn that the Pinto didn’t see coming (his own fault) and crashed into a fire hydrant. The hydrant survived better than the Pinto did. Lynn’s dad, Gilbert, was a founding member of the Black Widows (a local car club that opened legendary local drag strip Lassiter Mountain). 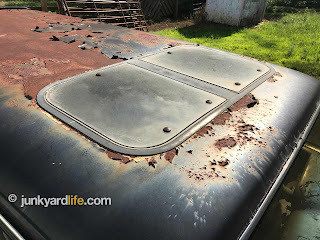 Lynn remembers the wagon being at the track. 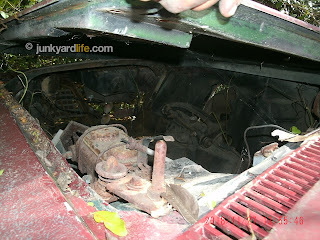 When Lynn got the car, he knew better than to hot dog in it due to a weak two-piece drive shaft that would not hold up to abuse. When in the mood to do any sneaky racing, Lynn and a friend would take out a 1967 Impala SS 427 4-speed owned by the friend’s father. The wagon pulled a boat to Smith Lake. Correction, the camper pulled the boat. The wagon was the camper. They slept in it while camping! Lynn drove and cruised this Brookwood for many years. 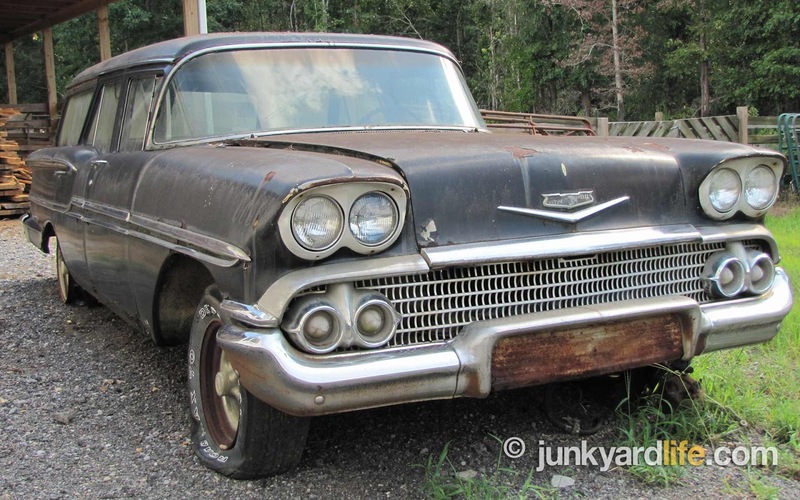 Eventually, the Buick power plant was sidelined in favor of a suitable small-block Chevrolet. It seemed appropriate, but it never happened. A newer car was purchased and took over full-time duty for Lynn instead of the long roof ’58. However, the black Brookwood wagon remained in the family. 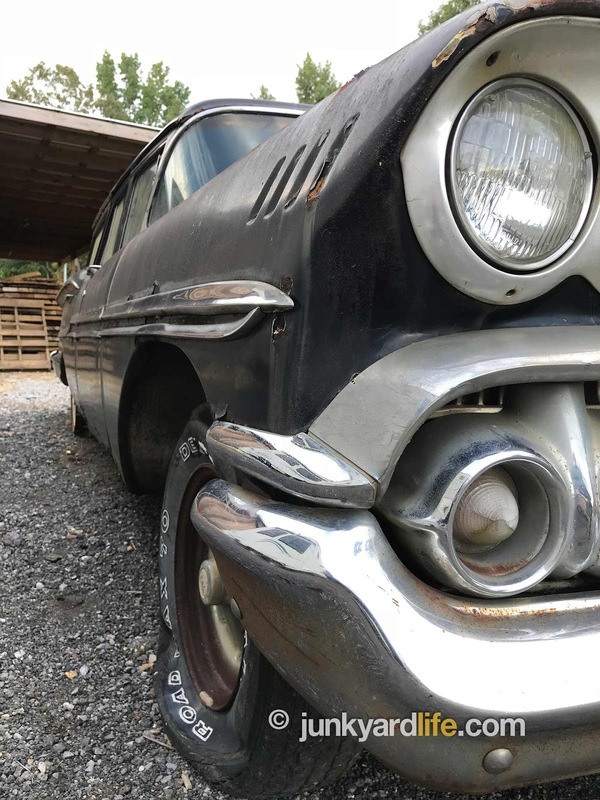 Parked for more than 30+ years, the ’58 Brookwood wagon has held up well. In 1987, Lynn Hurst became the proprietor of a very successful towing company. Hurst Towing, a name synonymous with his home base in Fultondale, Alabama. The wagon got shuffled around company storage lots and facilities, but never sold. It usually had a dry place to sleep. You can’t sell family. Pennie’s enthusiasm is contagious and within minutes she had us wanting to turn wrenches. 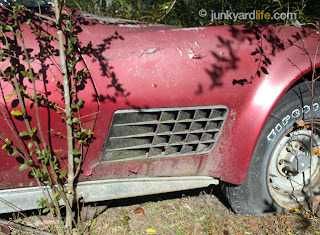 Much thanks to the Hurst/Carter family for letting us photograph this automotive heirloom. I have no doubt they will preserve this car and it will once again see the highway and this time no fighting over the keys! 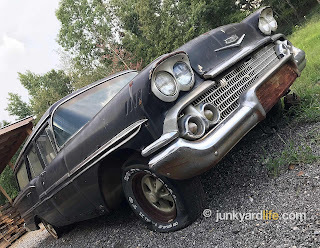 Body remains solid on the ’58 Brookwood because it spent many years stored indoors instead of outdoors in the elements. 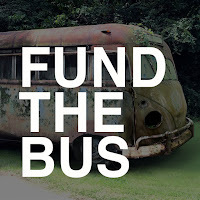 Fultondale Alabama has several ties in this story. (1) Sylvia Hurst delivered mail in Fultondale in this car. 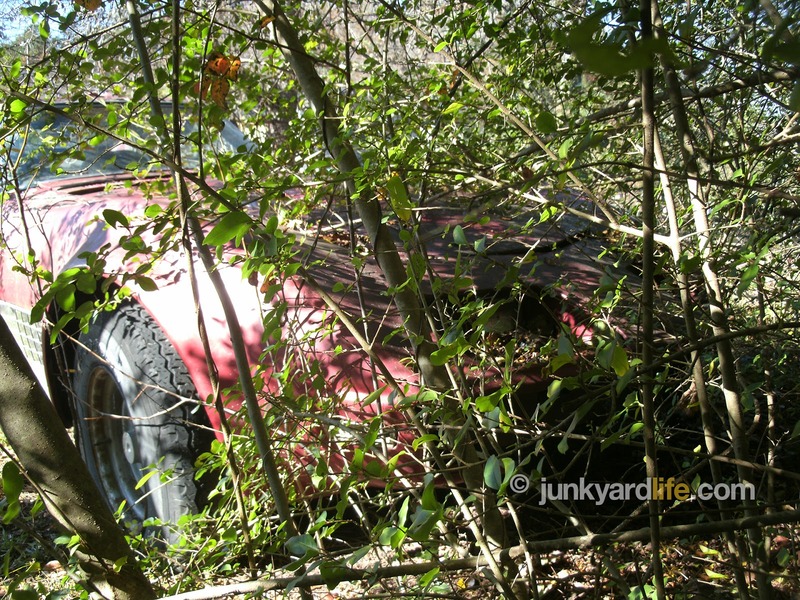 (2) The car was stored in Fultondale after Lynn Hurst started Hurst Towing. (3) Pennie Hurst Carter currently delivers mail in Fultondale. Daytona Yellow (code 51) was available on select few Chevrolet products including the 1969 Corvette and Camaro. 1958 was the first year for the 348 engine. The odd shaped “W” pattern was a preview of what was to become the 409 a few years later. Sharp eyes can tell the difference in a 348 and a 409 by the location of the dipstick. 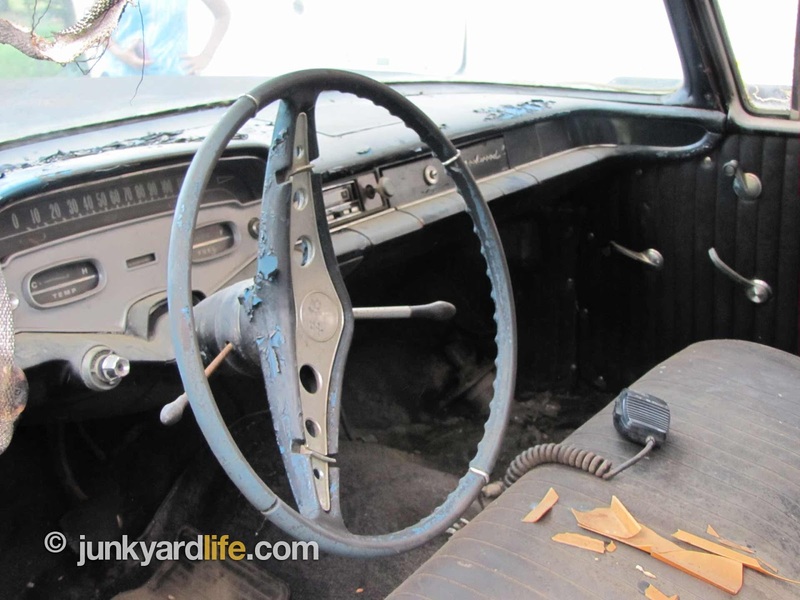 Ronny Howard drove the most famous 1958 Impala in the coming of age George Lucas film American Graffiti. “Martinique” was the name of one of ten 1958 Impalas “girlied-up” for the 1958 GM Fashion Show by Jeanette Linder. This car had a built-in lighted vanity mirror and a special make-up case that folded down in the dash. Where is the Martinique today? 1958 was also the first-year that coil springs were equipped all around. It was a design victory in their eyes, as it was to improve the ride from all corners. The same fuel options as used on the famous Oldsmobile triple two-barrel set-up known as the J-2 and Pontiac’s Tri-Power brought you 30 more horsepower on the new 348, bringing it up 280 hp. That would be fun and that is a fact. 1958 was the first year for the name “Impala” on a GM vehicle. An Impala is a small deer-like creature that runs for dear life from predators. 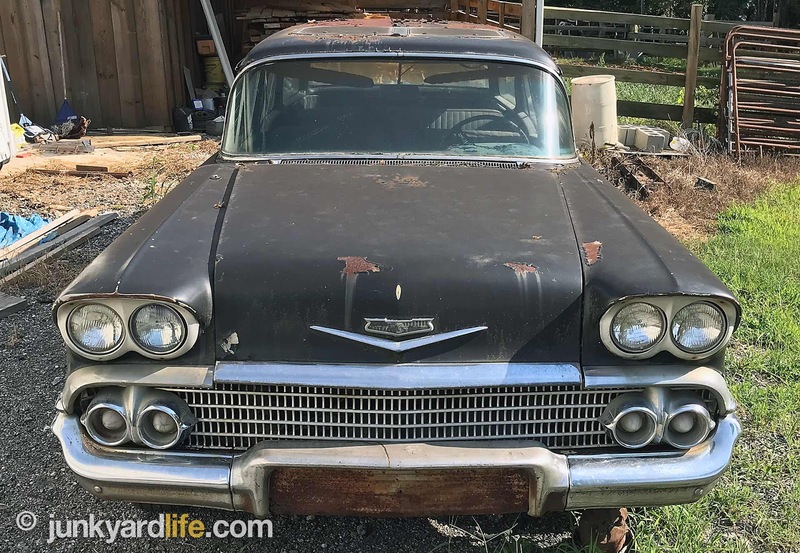 Chevrolet had great success with the Impala line. It usually indicated upper trim levels in their full-size line. 1958 was the first year for the X-frame. Designed for both structural rigidity and safety. 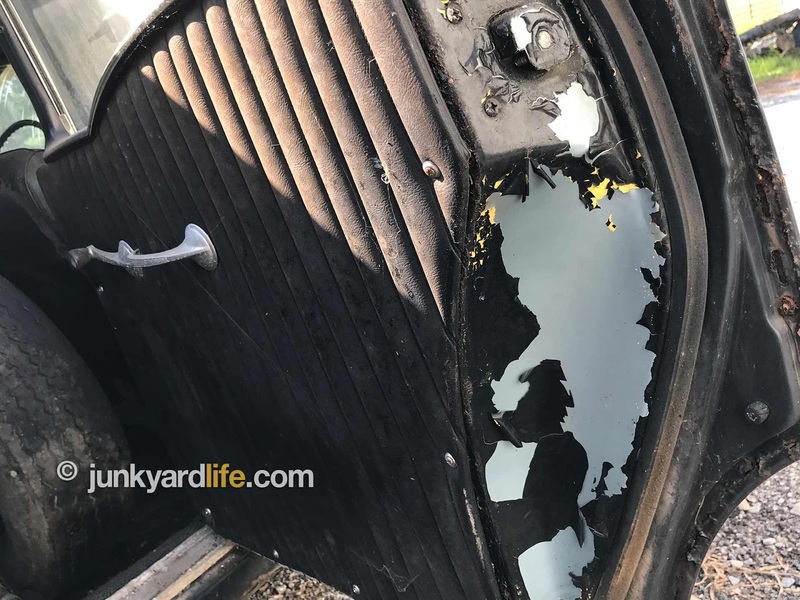 Layers of peeling paint in the door jam reveal the various colors that the 1958 wagon once wore. 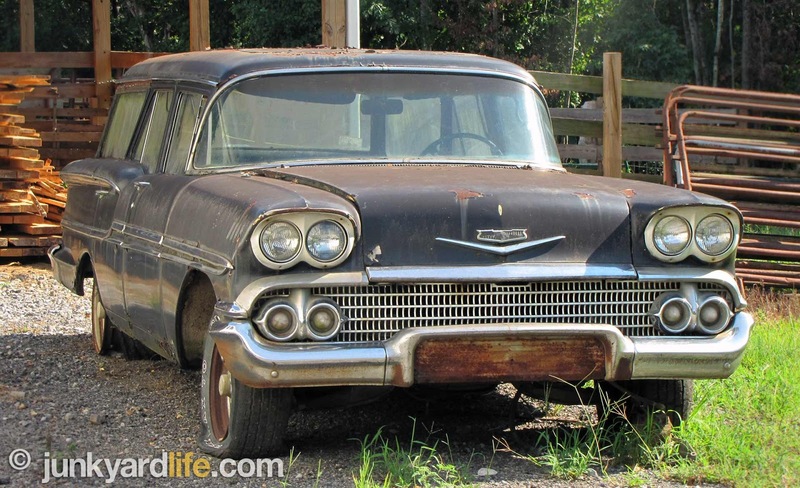 1958 marked the end of the Harley Earl design era at GM. Earl loved curves. Notice the curving trim surrounding the tail lamp on the rear of the wagon. 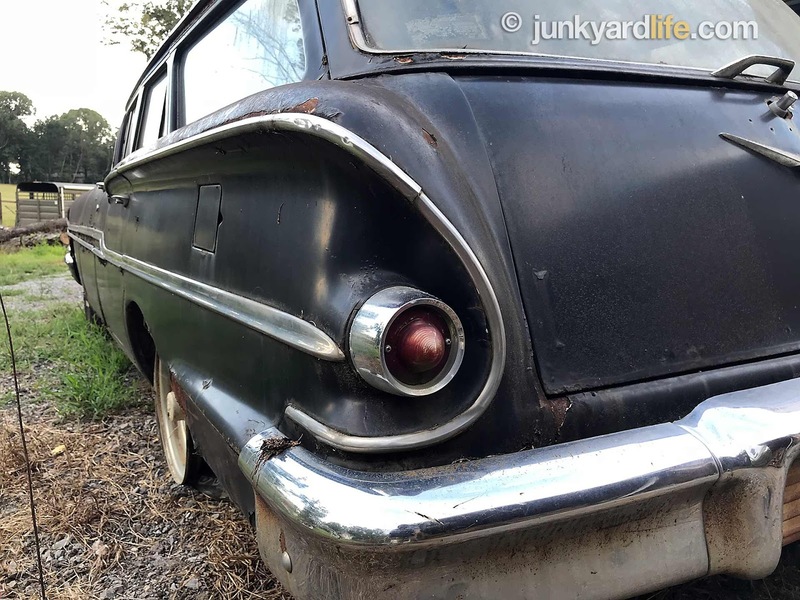 Sinister low angle shot of the rear of the black 1958 Brookwood wagon. Detail of the chromed rolling curves that make up the front bumper on the 1958 Brookwood wagon. Detail of the vent window and windshield on the 1958 Chevy Brookwood wagon. They don’t make them like this anymore. Remnant of teen stereo days sits in the back of the wagon. 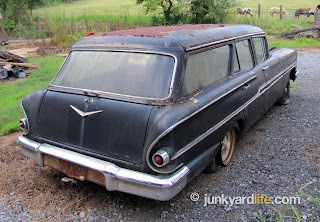 Chevrolet produced 170,473 4-door wagons in 1958. Long roof ’58 Chevy 4-door wagons weigh roughly 3,750 lbs. depending on engine/options. 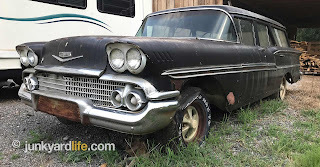 Front end, grill of the 1958 Chevrolet is menacing. 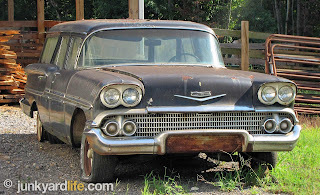 This 1958 Chevrolet Brookwood got parked when it was time for an engine swap. Decades passed and the swap never happened. 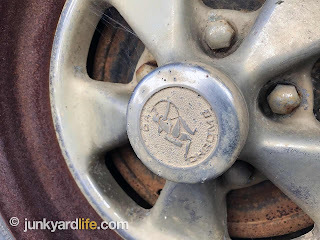 Vintage Cal Chrome wheels still mounted on the 1958 Chevy. Snapshot from the 1970s. ’58 wagon painted black, mag wheels, sunroof, CB, AM/FM/8-track stereo. Pop-up sunroofs were added to the 4-door Brookwood wagon. 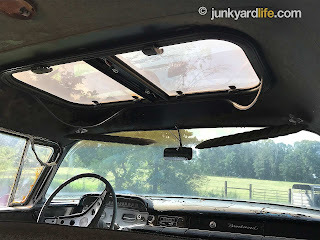 Interior view of the pop-up sunroofs in the 1958 Brookwood wagon. 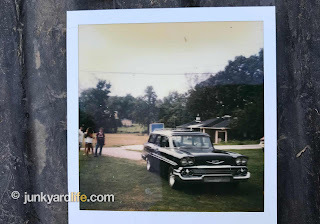 The Hurst family has held onto the family hauler for 55+ years. 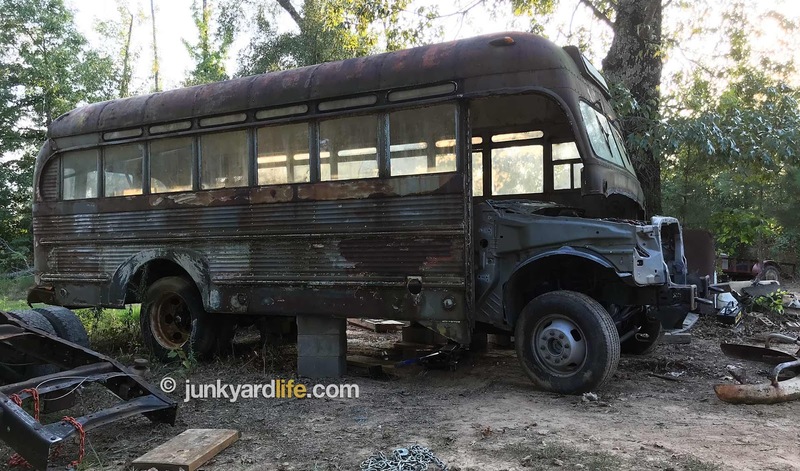 It may soon be on the road to restoration.